Employee wellness programs have become a staple in many companies as a way to attract top talent, keep them happy and productive, and decrease employee turnover. In fact, 80% of employees at companies with robust health and wellness programs at work feel engaged and cared for by their employers. The key to having a successful wellness program at work is encouraging overall wellbeing while still keeping it fun (see #57 for a perfect example). 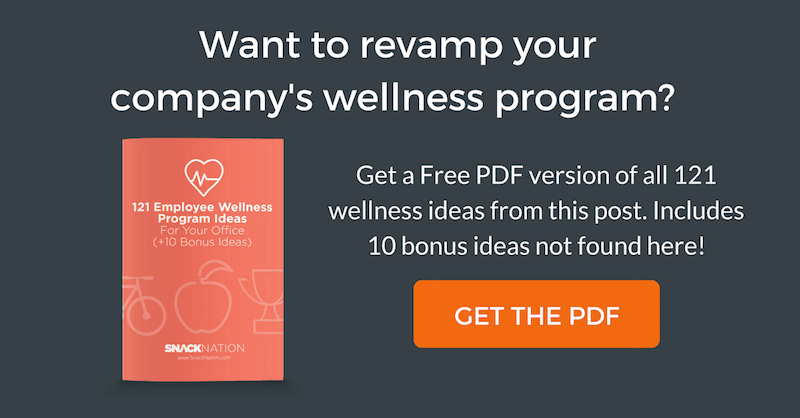 If you can’t get your team engaged then your wellness program ideas will quickly lose steam. So make your initiatives fun, try new ideas and see what your team values the most. 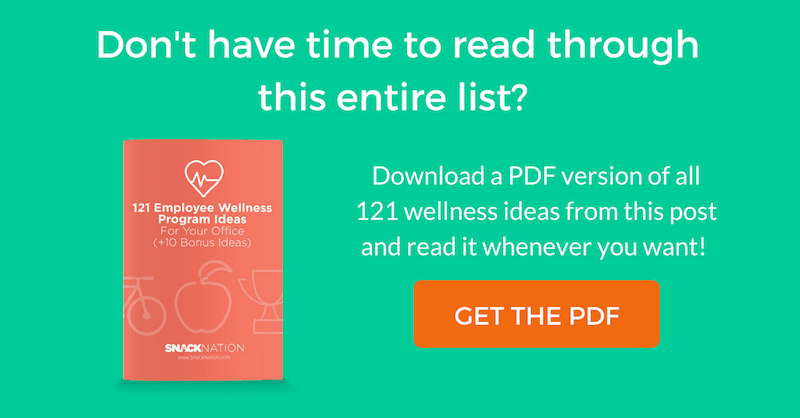 Below is a list of 121 employee wellness program ideas that you can easily implement at your office. Free bonus: Download this entire list as a PDF. Easily save it on your computer for quick reference or print it for your company’s next Wellness Meeting. Includes 10 bonus ideas not found in this post. This list of wellness activities & ideas are the ones we’ve used ourselves and have seen the benefits firsthand. Many others were contributed to us from awesome companies that know how to take care of their teams. Here’s a quick list of employee wellness program ideas voted on by our readers. Whether you’re a small startup or large corporation, there’s bound to be something here that will fit for your organization. 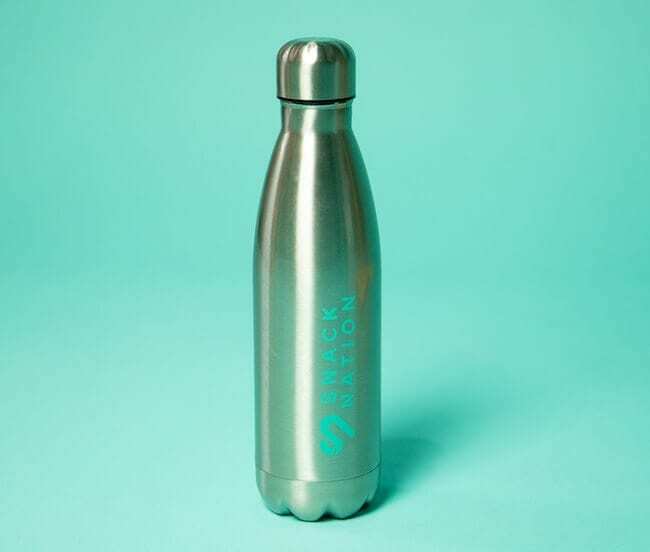 Promote hydration, sustainability, and company pride in one fell swoop by gifting your team branded reusable water bottles. Water bottles will encourage your team to drink more water throughout the day, which can help them maintain a healthy weight, increase their energy, and boost their immune system (among a host of other benefits). And since they’re reusable, you’ll help reduce the estimated 1.5 million tons of plastic waste that bottled water creates every year. Create a sign-up sheet with 2 columns (name and what you’re bringing) and post it to the fridge in the main break room for people to list what they’re bringing. Healthy snacks aid in weight control, improve mood, and boost energy, making it a no brainer to provide for your office. 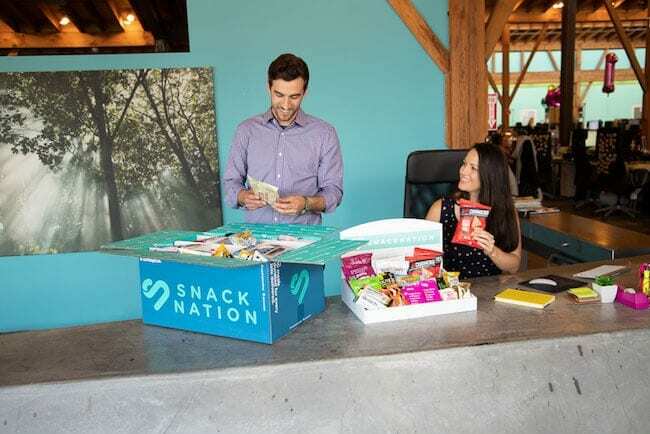 If you’re already providing snacks to your employees, consider making the switch to healthier alternatives by becoming a member of an office snack delivery service. Hire a chef who specializes in healthy food to come in for a cooking demonstration. Be mindful of the vegans and dairy intolerant folks. There’s a lot of marketing around the food industry that tricks people into thinking certain foods or diets are healthy, when in fact they are not. This article by Authority Nutrition does a great job of addressing some of the most common nutrition mistakes that you can share with your team. A company newsletter can be a great way to introduce new health and wellness ideas in the workplace. Setup separate google alerts for “fitness”, “nutrition” and “wellness education” and select “only the best results”. Compile the best articles each week or month into one email and send out for your employees to enjoy. If you offer your team snacks or meals with no nutritional value, make the switch to healthier alternatives. At the very least provide a majority of healthy items for your office and just a few traditional junk food items. To get some ideas, check out these healthy snacks for work and healthy office breakfast ideas. Bevi is a smart water cooler that dispenses refreshing still, sparkling, and flavored water that your team will love. This futuristic hydration station provides a healthier alternative to sugar-laden sodas, while reducing your team’s plastic footprint. It’s a popular fixture of the SnackNation kitchen – and it just looks cool. Varidesk offers adjustable-height standing desks that allow users to easily switch between standing and sitting while working. The switching aspect is key to getting optimal health benefits from a standing desk because it’s not healthy for people to remain in any one fixed position—sitting or standing—for too long. Give employees timers along with their standing desks so they can be sure to switch their positions throughout the day. Offer to pay for all organic produce employees decide to purchase. Reward your team for putting in the extra hours by ordering in lunch for them. Stick to something healthy of course – salads, wraps, Mediterranean, or a taco-salad bar or all good options. A lot of larger farms offer community supported agriculture programs where you invest in their farm, and they bring you fresh produce weekly. National wellness service provider TotalWellness actually does this for their employees, and if you get enough people from your company signed up they might deliver right to your office. It’s a convenient way to get some fresh, healthy food in your fridge while supporting local farmers. Ask employees to share their favorite healthy recipes. Compile the best ones into a collection and share around the office via a downloadable document in email or a simple printed booklet. Bring in a specialist who offers biometric screenings and health assessments, and more importantly, can give people a roadmap to improved health. Invite local vendors and companies to your office for a day to talk about nutrition and fun wellness activities at work. You should have no problem at all persuading local businesses to attend, as it’s a great way for them to promote their service. Ergonomics is the science of designing work tasks (and work spaces) in a way that limits stress on the human body. For office workers, this means things like keyboards designed to minimize the risk of repetitive motion injuries like carpal tunnel, screens that minimize eye strain, and chairs that minimize back pain. This assessment tool can help point you in the right direction to create wellness at work. In a study conducted by The University of Pennsylvania School of Medicine and Wharton School, employees who were financially incentivized to quit smoking were 3 times more successful at ditching the habit than non-incentivized employees. Staring at a computer for hours on end can take a toll on your vision. The blurred edges of computerized typeface force your eye to constantly focus in and out for hours on end, which can lead to headaches and fatigue. Here are a few of our favorite tools to help prevent eye strain. Flux adapts the color of your screen to the time of day. Time Out reminds you when to take a break. Pangobright is a free utility for Windows that dims the light on your screen according to your preference. Post a list of locations near your office offering flu shots on the company bulletin board. Dedicate hump day to try out any of the ideas on this list. This is a great tactic if you have an office that is set in their ways or otherwise resistant to change. One day a week seems much more manageable (and less overwhelming), and can be a gateway to healthier lifestyles. The average American eats 102.5 pounds each year, more than almost any country on the planet. But all this meat is bad news. Our meat-heavy diets have been linked to autoimmune and inflammatory disease, cancer, and heart disease. Make a dent in our meat addiction by encouraging your team to go meat-free at the beginning of the week. Don’t waste time and energy on corporate wellness initiatives that employees don’t find engaging or beneficial. Use Survey Monkey or Google Forms to create a survey to collect feedback from employees. A simple mindfulness program could give employees the tools they need to manage all this stress. A mindfulness practice involves focused awareness and acceptance of the present. It helps people pull away from thoughts of the past and the future, which is where we find most of the fear and doubt that produces stress. Try bringing everyone together once a week for a mindfulness session. Simply pile into a conference room, turn on a guided meditation, and voila—you’ve got a Mindful Monday! The American Psychological Association recommends social support for people looking to effectively manage stress. Anyone who’s ever experienced the joys of venting will understand why; when you talk about stress with others, you benefit from the listener’s outside ideas, perspectives, and solutions you couldn’t see because, well, you were too stressed out. Talking about your stress also helps process the underlying feelings causing your anxiety. During the stress circle, each employee gets a turn to talk while everyone else listens and offers thoughtful constructive comments. If your stress circle gets too big, split into small groups so everyone’s stress gets the proper attention. If possible, try and separate managers and their direct reports. You want your team to be able to speak freely without fear of reprisal. 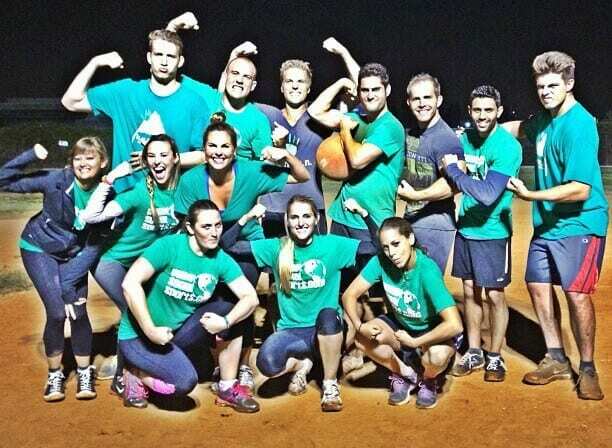 Google softball, kickball, basketball, or indoor soccer league in your city to see which organizations offer co-ed sports leagues. Offer to pay for some or all of the league’s entrance fee for people interested in participating. Invite a yoga instructor into your office every couple of weeks to guide the team through a yoga class. Find a 5K in your community and offer to cover entry fee for anyone who chooses to participate. You sit all day, so why not make your meetings a walking meeting instead? Research has suggested that walking makes people more creative. Scooters encourage people to move around the office. And let’s be honest, when was the last time you saw someone ride a scooter with a frown? 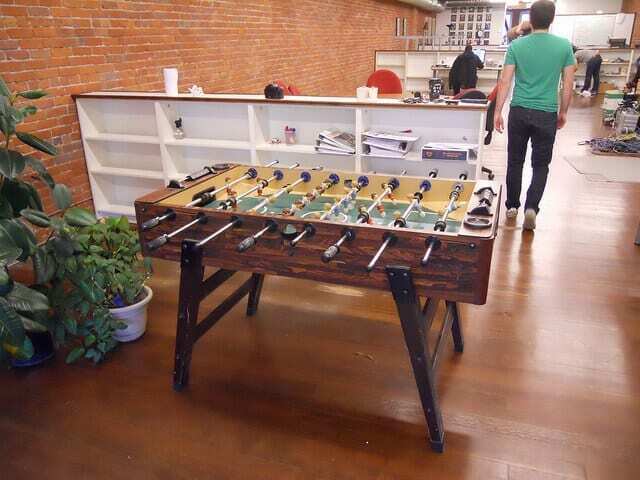 Make the office fun and encourage people to take a break and rejuvenate. Many gyms will offer a discount if you sign-up enough employees. Reach out to some local gyms in the area and ask for discounted group rates. For many employees, this little kick of flexibility could be just what they need to get more exercise, and in turn, feel better every day. Corporate wellness company Fitbug institute a daily wall sit challenge where employees increase the duration of their wall sits by 10 seconds each day, going until the last person remains standing. This serves as a fun fitness challenge idea that gets the whole office involved, and is a great way to get the competitive juices flowing! 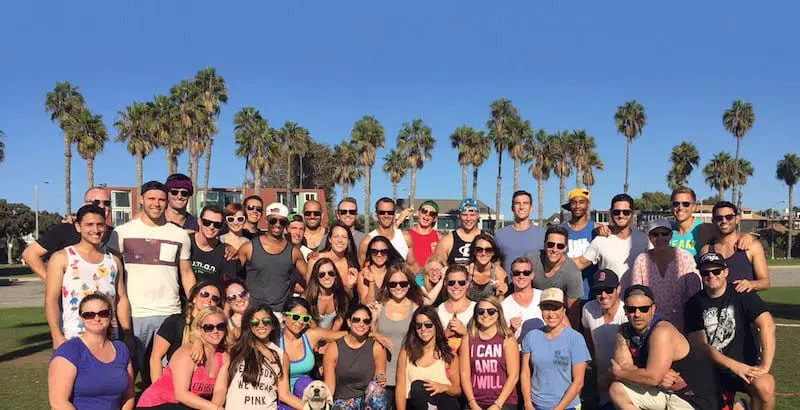 Harmless Harvest, makers of raw coconut water and tea, have combined team building activities with workplace wellness by hosting employee field days followed by dinner. Their team heads to a local park in the afternoon for a game of tennis, catch, soccer, frisbee, or whatever else people feel like doing (even if it’s just getting some sun on a nice day). Afterwards they have a healthy dinner by grilling out at the park or heading to a co-founder’s house. Wearable technologies like FitBit can help people monitor their fitness levels, track their sleep, and challenge friends who also have the device. The good people at 3 Birds Marketing take part in “Workweek Hustle” challenges where members of the team with FitBits try to out-step each other. For 30 days, employees track how many days they ran at least 1 mile. The winner at the end of the month gets a prize. 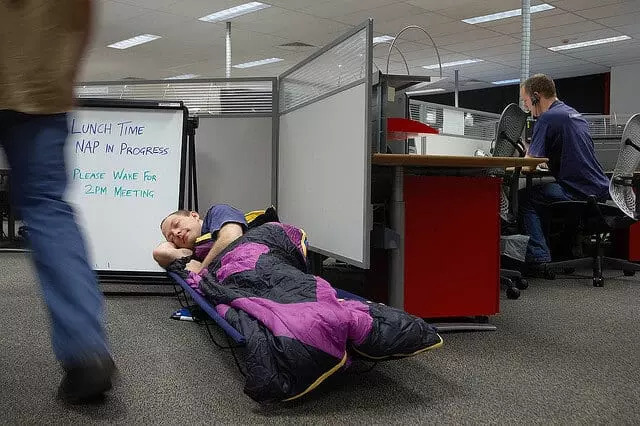 For 30 days, employees track how many nights they slept at least 7 hours. The winner at the end of the month gets a prize. For 30 days, employees track how many days they drank at least 8 glasses (8 ounces) of water. The winner at the end of the month gets a prize. The 8 week long Whole Life Challenge incentivizes major lifestyle change by awarding points for completing each of the 7 Daily Habits: nutrition, exercise, mobilize, sleep, hydrate, lifestyle, and reflect. Game mechanics help keep you engaged, and a scoreboard keeps you in friendly competition with co-workers. Companies like Watson Adventures can help you do the heavy lifting of coordinating a scavenger hunt. Throw down a challenge of the month – most push-ups, most miles run, most miles biked. Have your staff make their favorite healthy recipes and bring them into work for a cooking contest voted on by the rest of the office. The people over at Corporate Fitness League offer a step-by-step plan on how throwing a successful Biggest Loser Challenge at your office. Check it out here. 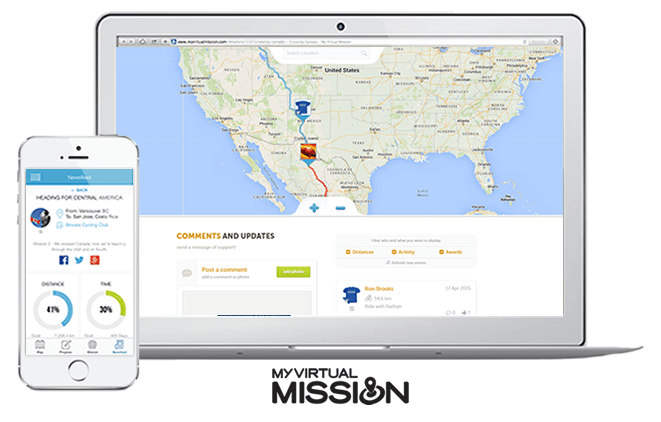 Map out a long distance “virtual mission” from one location to another on My Virtual Mission and challenge your office to complete it either as a team or competing against each other in a virtual race. You could also raise money for a local cause – it’s a win-win! Encourage healthier lifestyles with impromptu contests. Who brought the healthiest lunch or who can do the most pushups? Track 3 things you’re grateful for everyday on a shared Google sheet for 21 days. Research on the physical and mental health benefits of gratitude has piled up in recent years. Practicing gratitude boosts overall wellness; it can make people happy and even inspire them to exercise more. The benefits of napping include improved creativity, productivity, and memory. Put a comfortable recliner in an unused room in your office to create a “nap room”. Pick a 15 time-slot in the afternoon for everyone to get away from his or her desk. Go outside, socialize with each other, and enjoy some fresh air! Before you laugh in my (virtual) face, hear me out. Offering your employees unlimited vacation shows you trust your staff to be responsible and take time off when they need it. The best way to implement this program is to tie it to performance, meaning projects need to be on-track and goals being met. It’s a win-win because employees have more flexibility and employers can reward good performance. Give your employees an allotted amount of time each month to leave their desks during the day to volunteer. Ideas include volunteering at a local food bank, or cleaning up a park, beach, or trail. You’ll benefit doubly from team bonding and group physical exercise. 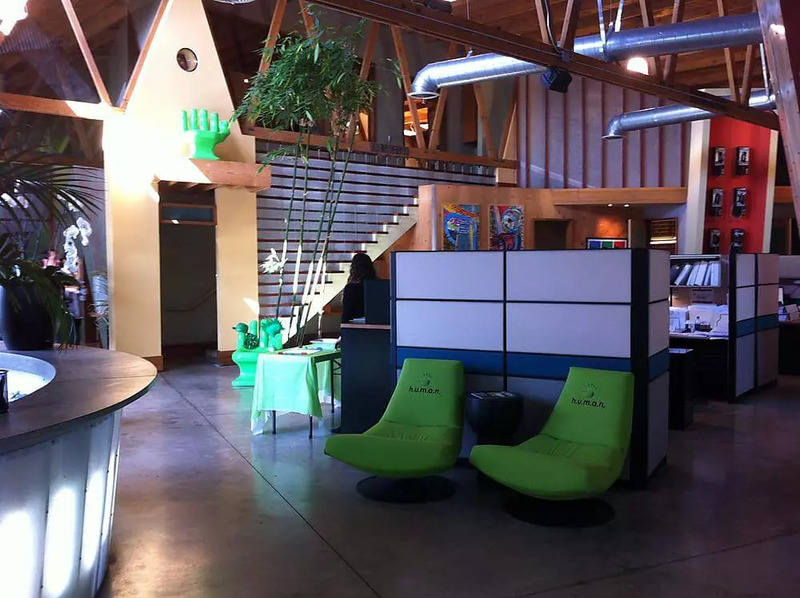 Hack Reactor has a company break room that requires access through a smartphone. It includes a series of soft, comfortable couches for relaxation or naps, turfgrass (so you can feel the experience of being outside without leaving the building), a cubby for shoes, and a strict rule of no work talk! Employees are free to listen to guided meditations, play board games, or do yoga. You can also offer 1 floating holiday for the year if they choose to work on their birthday. Studies have shown that taking breaks is a good thing for our productivity, so encourage people to schedule a small 5-10 minute break every 90 minutes to rejuvenate and come back strong. Studies have shown that taking even small breaks provides major benefits; researchers at University of Illinois at Urbana-Champaign found that small breaks improve focus. The study authors believe you can regain engagement in a task after a short break because of how our brains are wired to judge constant, repetitive stimulation unimportant. A small break from a task can make a tedious job seem new to a fatigued attention span. Offer a month-long sabbatical for all employees who hit the 5-year mark of service. For more ideas, check out our list of 121 ways to reward employees. 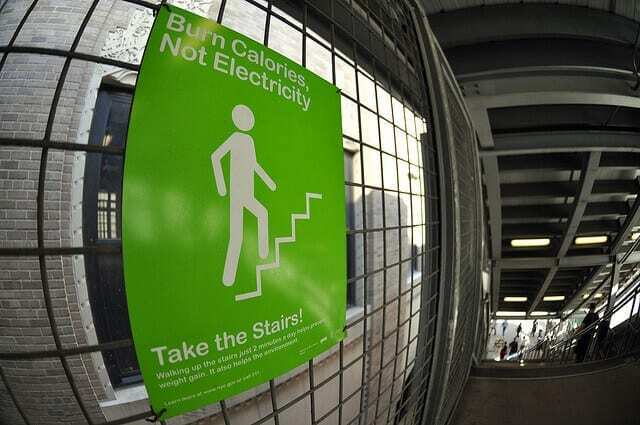 NuGo Nutrition says that when people get frustrated at the office, they tell them to go for a walk around the block. They find that fresh air and some sunshine often make people more productive once they get back. Give employees the option to choose how they want to use their bank of paid time off (sick days, personal days, and vacation). Pick a day of the week for people to dress up in a certain theme. 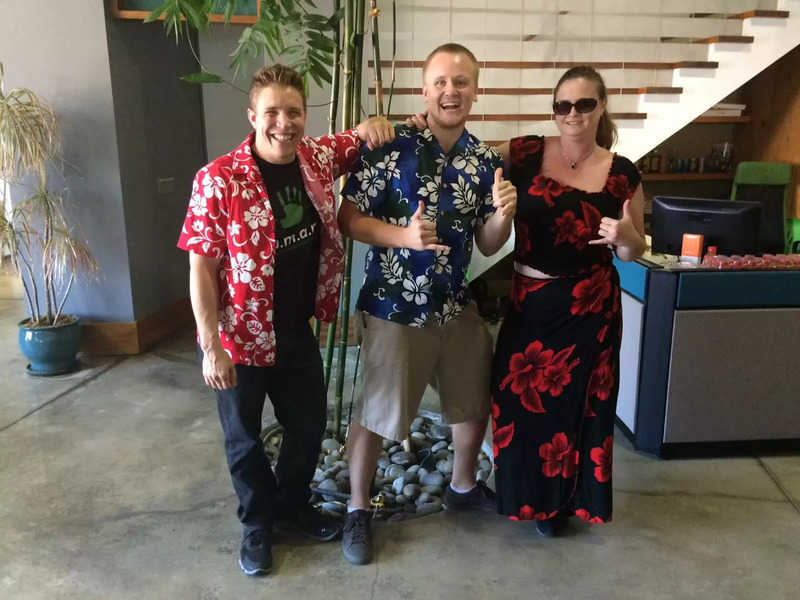 Our office recently started something called “Aloha Fridays” where team members wear their favorite Hawaiian shirts to work. Theme days are a great way to boost employee morale and engagement. Play some music through speakers around the office. Studies show that music improves mood, which can help boost productivity and creativity. Opt for music without lyrics and keep it at an ambient noise level. The SnackNation Ultimate Productivity Playlist is our personally curated selection of lyric-free songs guaranteed to maximize focus and increase your effectiveness. Voted by Outside Magazine as a Top 100 Place to Work, Team One implements a fantastic rideshare program that rewards employees for carpooling. Each employee gets a card to mark down the days they partake in ridesharing. Each day counts as 1 point and Team One also throws in double points for certain days of the week. Once an employee hits 30 points, they get a $25 gift card. Working hard deserves some playing hard. Take your team out for Happy Hour after a long workweek to help everyone unwind before the weekend. Buy a bunch of $25 gift cards to Amazon or local restaurants, put the name of each team member into a bowl and select one at random each time a big sale is made or project completed. Most businesses experience a decline in sales/business activity during the summer months. Let your employees enjoy more of their summer by offering half day or shortened day Fridays between Memorial Day and Labor Day. By allowing people to ditch the heels or suit and tie, employees will be much more inclined to take a walk outside or bike to work. Panjo, a mobile marketplace for auto, sport, and hobby enthusiasts, doesn’t provide parking spaces to associates who live within 2 miles of their office in order to promote biking and walking. In inclement weather the company covers the cost of a taxi, Lyft, or Uber ride for the walkers and bikers. There are many health benefits associated with having a “Green office,” including fresher air, improved emotional state, and a reduction of office illnesses. A University of Queensland study found that an office outfitted with plants can actually increase employee productivity by 15 percent. Welcome new hires onto your team by taking them out for lunch with your department. The “why” of an organization is almost always more important the the “what.” Hire a graphic designer to create a poster or a foam board printing cutout of your company’s mission and core values and post it somewhere with a lot of foot traffic like the breakroom, central conference room, or waiting area right where people walk into the office. Core values can help instill a sense of purpose to your employees’ daily work, which will lead to elevated moods and higher employee engagement. Pets in the office help employees reduce stress and increase things like communication and productivity. Plus pet owners take multiple walks throughout the day. Include all team member pictures and a short blurb sharing something unique about them. Organize an impromptu chair race. What’s the worst that could happen? Remind your employees that their hard work has been recognized by outside organizations. Frame your accolades, honorable mentions, and community awards around the office. Create fun awards like “The Duct Tape Award” (the person in the office who fixes everything). “The Pearly White Award” (the person who smiles the most), or “The Cliff Jumper Award” (the person who takes the most risk). Ask people to bring in old clothes to be donated to a homeless shelter or Goodwill. Make yearly work anniversaries a celebration. Send an email out to the team to commemorate your team’s anniversaries. Also have the CEO or someone else on the executive team craft a hand written note to that person thanking them for their service (this goes a LONG way). Probably one of the best wellness activities for groups you can do are retreats. 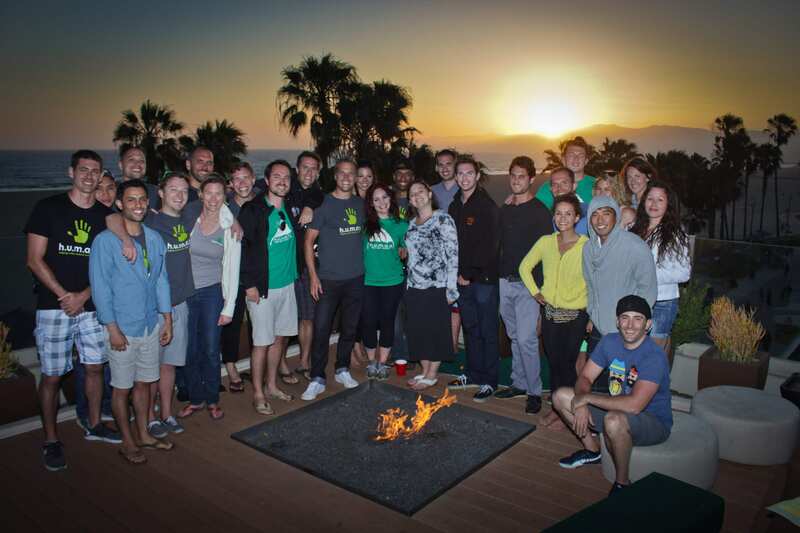 Company retreats are a ton of fun and a great way to brainstorm new ideas to drive the company forward. Use the beginning of the day to work on the company and then follow it up at night with a group dinner and drinks. Create a sign-up sheet with 15-30 minute blocks per massage. Just like White Elephant around the holidays, setup a gift exchange just for fun. Hold a contest to see who can customize their cube the best and vote on a winner. It doesn’t have to be Halloween to dress up in theme. Why not a random Wednesday in March? A Netflix subscription, babysitting, custom shoes, tickets to a sporting event. Check out our list of company swag ideas your employees really want. Setup a Nintendo Wii, foosball table, darts, or ping-pong table for some friendly daily competition. Make sure your team has all the cool company swag you giveaway at conferences and social events (Hats, t-shirts, polos, pens, etc). Call the nearby theaters and find out which ones offer a group discount. Throw the old coffee pot into the trash and upgrade to a bean-to-cup coffee machine or coffee keg. Offer an employee discount program for your service or product at 25% off or more to employees. Offer to subsidize a set amount of an employee’s insurance premium when they log a certain number of exercise hours each month. There are also several apps and services in the digital health marketplace that can help employers ensure that their workforce is adopting and keeping new, healthy habits. Here are four apps that can help your workforce achieve their New Year’s resolutions. The holidays always seem to be an excuse to eat food that’s not good for us. Instead of the traditional junk food, offer green juices/smoothies on St. Patrick’s Day, red bell peppers and hummus on Valentine’s Day, turkey jerky around Thanksgiving, blackberry and orange fruit salad on Halloween. Your busy people could benefit greatly by having a laundry service pickup their clothes and return them back to the office. Chances are your good people know other good people, so offer employees a bonus for referring someone who is hired and kept on for at least 6 months. Make a fake currency where people can reward each other with “Team Bucks”. Allow people to collect and trade their “Team Bucks” in for real-world prizes like gift certificates. Make it fun and hold an election every quarter, 6 months, or year where the whole office gets to vote on the new woman or man in charge. If your company is not already doing so, consider offering new mothers paid maternity leave. Lay out some hot water, tea bags, and some healthy treats. Google “inspirational quotes” and write them down on strips of paper. Put all the quotes in a bowl. Invite people to take a 15-minute break to enjoy a cup of tea and snack and have everyone grab 1 quote from the bowl. Ask people to submit photos from their hikes and highlight trails they walked. A facebook group will also easily allow people to organize group hikes. Purchase a Dry Erase Spinning Prize Wheel from Amazon that employees get to spin for prizes when they hit special milestones like achieving a quarterly goal, winning a company challenge, etc. According to the Mayo Clinic, laughter really is the best medicine. Laughter has a number of short- and long-term benefits, including improved immune system, elevated mood, and reduced stress. To get your office chuckling, give away two tickets to a local comedy show or even invite a local comedian to perform. Setup a time in the morning and/or afternoon for employees to walk together to the local coffee shop for a pick-me-up. It’ll also give people a chance to catch up and exchange some laughs. Companies like Apple offer to match any charity or philanthropic donations made by employees. Give hybrid car owners an assigned parking spot in the parking lot. Find an empty office or unused area around your office and turn it into a place where people can meet and collaborate on projects. Install some comfortable furniture so people can set up shop away from their desks and let the creativity flow. Everyone likes more flexibility with work because it allows him or her to structure their day to their lifestyle. Kick the habit of mandated working hours (i.e. 9am – 5pm with a half hour for lunch) and focus more on results. What matters most is the quality and effectiveness of someone’s work. Nothing is more important than the personal and professional development of your employees. Offer a flat or percentage based subsidy for personal development books, seminars, and training courses. Give your responsible and reliable team members the option of working remotely 1 day out of the week. Remote work allows people to work more productively, eliminate long commutes, and spend more time with their family. Get a whiteboard where people only write their non-work related wellness goals. Things like “Go to the gym 3 times per week”, “play basketball 4 times per month”, or “read 10 books this year” are some good ones to get people started. Doing so will create a sense of common cause and accountability, spurring higher goal completion rates. Schedule a daily huddle with all department team members to verbalize everyone’s main goals for the day and let others know if they are needed. Google used to offer “20% time”, which allowed employees to take one day a week to work on side projects (provided it advanced Google in some way). The program led to the developments of Gmail and Adsense, so it could give your team some time to let their true creative genius shine. From 9am-noon, try banning any non-urgent meetings and interruptions with each other. It’ll help everyone in the office get more work done early in the week so that the end of the week can be less stressful. Check out our list of 27 ways to improve your work productivity for even more tips. For more ideas like this, check out our list of the best employee recognition ideas. Choose a day of the week or month to gather for a company-wide Lunch and Learn. Allow team members to present on a topic they’re interested in (whether it’s work related or not) and use this time to discuss important company updates. Revolutionary news site RYOT hosts a brown bag lunch every Monday where the company meets to discuss goals and triumphs. Schedule half an hour on Friday afternoon for the company to gather together and go around in a circle naming off another person’s work they want to acknowledge and 1 thing they are grateful for that week. 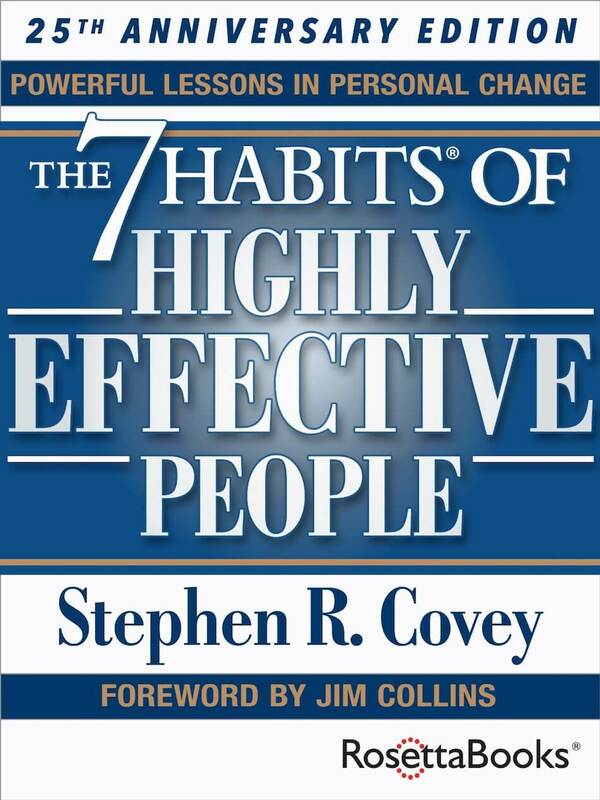 Reading interesting books allow employees to share ideas on a wide range of topics. Select a book each quarter and allow people to form small groups to read and review. Setup a bookshelf in your office and ask everyone to lend books to the library. Create a sign-up sheet so people can check-in and check-out books. Who doesn’t love a great quote, right? Most companies have a bulletin board or chalkboard where employees frequently pass by. Write a new inspirational quote daily or weekly to energize the office. BrainyQuote is a great site to find quotes. Toms Shoes has a wellness wall at their office in Los Angeles where employees can post things like healthy eating tips, exercise routines, etc. Vision boards are a way for people to associate images with the things they want to achieve in life. Christine Kane breaks down how to create a vision board in 5 steps. Emotional wellbeing depends on the ability to recognize and process events in healthy ways. The ability to process makes people resilient because, in many cases, it’s the only aspect of office life and office politics we can completely control. That’s why group classes in emotional intelligence, a skill that helps people process and manage both internal and external emotions, make incredible workplace wellness programs. Every benefit sharp emotional intelligence offers—including enhanced communicating, clear thinking, and deepened interpersonal relationships—boosts wellness levels around the office. Look for emotional intelligence coaches and trainers in your area, or see what online resources, such as Lynda, have to offer. Setup a jar with strips of paper and a pen next to it for people to acknowledge someone else’s work. Read the acknowledgements aloud during your weekly team meetings. Seasonal Affective Disorder is a form of depression that afflicts office workers during the winter months, when the lack of light affects the production of brain chemicals like serotonin and melatonin. To ward off SAD, maximize the amount of natural light in your office, or use bright artificial lights (like the Verilux HappyLight) at employee desks. One of my favorite Core Values at SnackNation is “Seek Perpetual Growth”. One of the best investments an organization can make is in the development of its people. Encourage people to seek ongoing education by subsidizing any classes they take that will help them grow in their position. Employee wellness programs can be difficult to manage. There are plenty of corporate employee wellness tools available to organizations that help manage and maintain programs to keep team members engaged and active. These platforms can help with employee health education and conduct confidential health assessments, as well as increase employee participation and progress through gamification that includes incentives. Regardless of the size of your business, there are several reasons you and your employees can benefit from an increased focus on employee health and happiness. Employee wellness programs are a vital component in attracting top talent, keeping them happy, and decreasing employee turnover and absenteeism. Many of the best companies to work for already offer their workers the awesome employee wellness ideas listed above. Now it’s your turn to improve the well-being of your workspace. So what ideas are you using for your wellness program? If we’ve missed an awesome ideas for wellness or just wellbeing at work ideas in general – let us know in the comments below. Haha, your comment made my day. So, how are u feeling now? Hi Autumn, happy to hear you liked these wellness ideas. Hope you have successful Wellness Weeks next month! Our office brings in a Yoga instructor on Fridays each week. It’s really brought us together and started a lot of conversations about how to have a healthier office. One or two things from the list can really kick start a boost morale, and office wellness. Hi Hannah, thanks for sharing your office’s wellness ideas. Those sound awesome! Thanks a lot for sharing the ideas, very useful and inspiring! Hi Svetlana, happy they were useful for you! wow wonderful ideas , though we also think often, putting them together is a great work. Sure thing, Gary. Glad you find some useful ideas here. My office brings in an all-natural juice company for our employees. We’ve also tried the almond milk suggestion which many of employees have really enjoyed. Hi Morgan, sounds like you have an awesome office that genuinely cares about employee health. That’s great to hear you guys have tried almond milk as a substitute. It’s surprising how many people have a dairy allergy and don’t even know it! I love these ideas! My company is already doing some of them (new hire luncheons, sabbatical, gym reimbursement). I saw some great ideas and can’t wait to try them. I’m especially interested in putting together an office cookbook, since many people cook/bake and bring goodies to share. Good work Emil. Nice compilation. Thanks Alice! It took a long time to put this list together, but it’s been well-received. I’m glad this whole article explains everything what we need. Awesome ideas. My company was conducting activities few of them, named as Friday fun. But Emil just poured the blast. Sure thing, thanks for leaving a comment. Thanks for taking the time to read and comment here. Hey Emil!! Really great tips!! I love #104 best… laughter really is the best medicine!! One more thing you might like to include is “Encourage employees to have a healthy breakfast every morning!”.I have put together a list of 100 Healthy & Tasty Breakfast Recipes, in an attempt to encourage people to start their day with a healthy breakfast. Do let me know if you’d like to see it! What an awesome list of creative and thorough ideas! I love the engagement jar idea. Thank you for sharing! WOW! simple but really effective ideas! Sure to share with my friends. Hey Emil!! Awesome ideas! simple but really effective ideas. I like number 88 the best. I can’t wait to try some of these ideas! Thanks for the kind words. Let me know which ones you try and how well they work out. Great list of awesome ideas, workplace health and wellness is so important! Awesome ideas Emil, I read the list fast, and when I reach to the point number 53 “encourage nap time” I become so happy and confused because all of us know that taking a nap is so healthy but few people take real steps to encourage the employers to do so. Thanks for ideas. Thanks Emil for sharing this great list of ideas. I also wanna to add an idea; every one of employers have to teach his team something new in his field every week. You can put this idea in challenge list and the winner can get a prize or something like that. Hey Dott, that’s another really cool idea. Thanks for sharing with us! Great work here Emil, I saw your story on Backlinko and had to come check this article out. Quick fix – under #18 “better posture” is coming up as a 404. Thanks Kevin. And thanks for pointing out the broken link – fixed! Hi Emil, So many creative ways to engage employees and promote wellness. i LOVE IT! Do you have any recommendations for companies that can do on-site wellness meetings each month. We have 3 locations in NorCal and 3 in SoCal. We would like to hit one office live each month and record the training for the other offices to view. Hey Emil – You are wonderful. So many creative ways to engage employees and promote wellbeing. Thanks for sharing. Its really useful.. Interesting comments ! I was enlightened by the insight – Does someone know if my company might be able to get ahold of a fillable CA EDD DE 2501 copy to complete ? Really enjoyed reading this article…in fact it was so long I had to stop a few times and come back to finish. Mainly though, it’s been good resource that we’re able to forward on to our clients in the Tampa FL area. It’s nice to push a little extra value their way. Thanks for the post! Emil, this is a fantastic list! We’ve been looking for a few ways to start shaping our company culture and introduce some more benefits to our staff and this list is going to be super useful. I think that the best companies are now moving beyond simple salary – getting the benefits right is going to be fundamental to attract top tallent. Sure thing, glad you found this list useful. 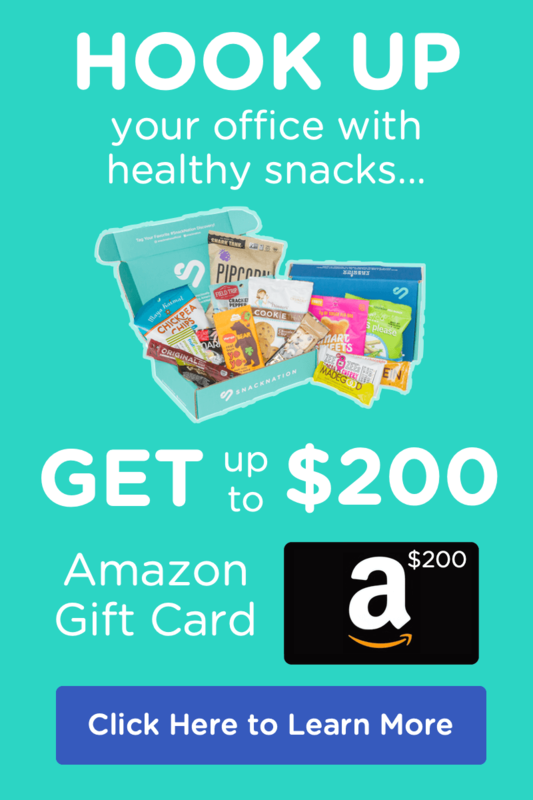 You might also want to check out our post on the top employee perks – https://www.snacknation.com/blog/best-employee-perks/. Really good ideas on what perks employees value the most. We used to offer cheap snacks to our employees but made the switch to fruit and other healthy alternatives but no one seems to like them nearly as much as the sugary sweets and chips we use to have. We do try and have a healthy barbecue or picnic once every few months though and we encourage fitness and working out. that’s seems to improve moral but not our employees health. Thoughts? Mostly fresh fruit haha. We have tried healthy snacks like granola bars and those seemed to be a hit but fruit hasn’t gone over well. That’s understandable. It’s hard to get people to go from “junk food” to the other end of the spectrum w/really healthy stuff. I think you’ll get a lot better reception if you start offering healthier alternatives (like the KIND bar instead of Snickers bar example). 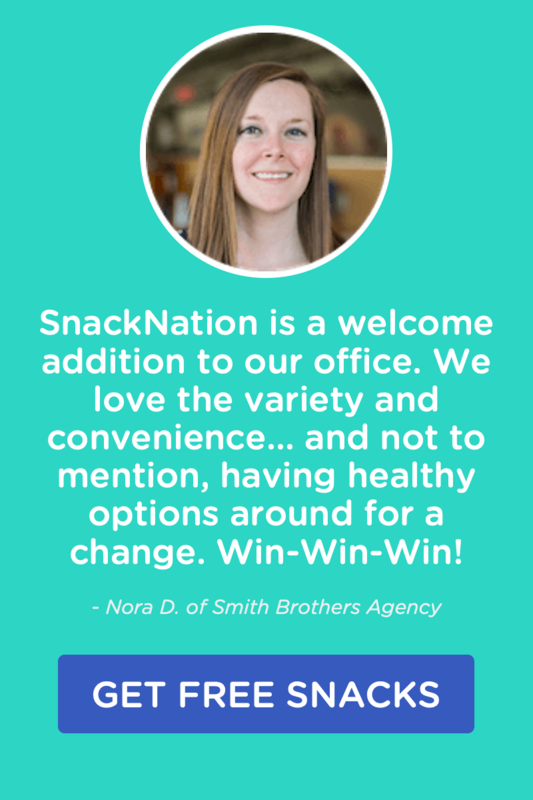 Can I ask what’s stopping you from giving SnackNation a shot? No pressure, just curious because it sounds like we can help you get your team on board with healthier options without sacrificing taste. 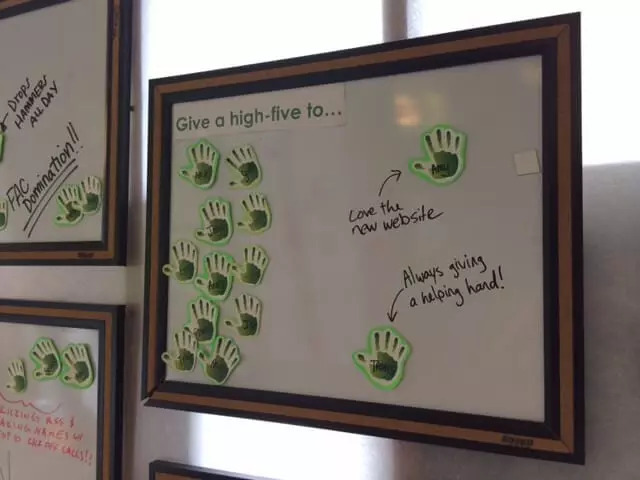 Hi Emil..I work for a wellness organization where we train companies and organization on comprehensive workplace wellness.You have really helped me get good tips and ideas to share to them.Really creative especially the high five board and spin board. Great blog post! We use a lot of these same ideas at Sonic Boom Wellness to keep our employees engaged and happy. One of the best ways to relieve stress is having an office pet to roam around the office … we have a husky named Sierra that will make you smile no matter how rough your day is going! Great Article, and love all the comments from the wellness community! With all these helpful tips, there are plenty of ways that you will enjoy an employee wellness program (plus who doesn’t love healthy snacks, am I right!). What a list Emil. Well done. I think you’ll get a lot better reception if you start offering healthier alternatives , true isn’t it ? Thanks for sharing. Very peppy and creative ideas for bonding and holistic growth. Awesome post, Emil. There are a ton of great/unique ideas here. Of course, #16 is my favorite. I’ll be sure to share! I love the idea of having the FB group with a list of walking pathways in your city. Starting a walking club would go nicely with that and you could set up lunch and weekend walks with your work pals. I think you’ll get a lot better reception if you start offering healthier alternatives, true isn’t it? Interesting article . I’m gonna implement these . Did you seriously post an idea that included charging employees a “tax” for choosing to drink soda vs a healthier alternative? That idea is not just distasteful, but it’s almost outright offensive. I understand why some people might not agree with this ideas. The point of a wellness program is to change unhealthy behaviors and habits with healthier ones. While most companies offer free sodas, and easy way to change that habit is to subsidize it instead of making it completely free. I probably don’t need to tell you the power of free, but here’s a really good article that demonstrates how much it plays a part in our behavior – http://www.newyorker.com/magazine/2009/07/06/priced-to-sell. Hey My office brings in an all-natural juice company for our employees. We’ve also tried the almond milk suggestion which many of employees have really enjoyed. Thanks, Anmol! Glad you enjoyed it. I am referring your site in a regular basis and this is awesome. Awesome! Glad we can be of service. Thank you for sharing this excellent information.. Such an amazing post thanks. There are so many great ideas here that we could add to what we are already doing. Thank you!! Emil, gosh this is great! It would be tremendous to implement even a handful of these tips. It is a challenge, where I currently work, to incorporate the outside of work growth (particularly with health, fitness and personal growth) into the day-to-day role. Many others would benefit and creating a more harmonious environment would be fantastic. Thank you again! The list is fantastic and sooooo helpful. Great article!! Our issue is there is NO motivation from the employees. We do several of these things and the turn out is minimal. Any suggestions how to create excitement and motivation? It really helped me a lot. Thank You! Really Nice Post. Thanks to Sharing Such a Nice Information for All. Hello Emil, good article writing. Thanks for the useful tips. Glad you found these ideas helpful. Thanks, Rajeev! did you know this article is populated in the non-English webs? I am refereed from non-English webs. Glad to read this such an awesome informative blog post. keep sharing it. Very informative post, Thankyou Monica for Sharing !! I have bookmarked your page for future ref’. These 121 ideas gives great confidence and clear idea in support with the personal identity. Thanks for sharing this. Indeed a great post. Thanks for sharing with us. I would love to share this post. keep posting.. There’s so many bloggers to potentially sift through lists like these definitely help people find high quality information. Thanks, Rizky! So glad to hear your company is taking extra steps to focus on employee engagement! Awesome list! Saved me a lot of researching but drew me down a rabbit hole of exploring all the great resources and links. Thank you!!! So glad to hear it, Cheri! Thanks! Wow.. awesome list. This “The 8 Glasses of Water Challenge” list, that looks easy but is hard to do. I know I always feel more valued as an employee when the office provides things like gifts and food. I like your point about how providing snacks for employees can also give them healthier alternatives to what they bring from home. I know I’d make an effort to eat healthier if my workplace provided these things. I just joined our district wellness committee and I found some great ideas to bring to the meeting! So glad to hear it, Lois! This post has helped me a lot. Thanks for sharing. I will recommend it to my colleagues. Thank you for sharing useful information . I am very happy after read this post,You have shared all major tips of related to “Employee Wellness Program “. hanks for sharing this very nice and very helpful article and expecting more articles like this in future. Indeed a great post. Thanks for sharing with us. I would love to share this post. keep posting.. I totally agree about point #23. It’s really important that your employees are happy with the working environment in the office. If they are happy they can focus on their work properly. Very Good Idea Sir, Thank You so much. This list is excellent and has given me so many ideas. Thank you! Glad to hear it! Thanks, Natasha! I am gonna try these ideas. Thanks man for awesome post. Great post and ideas for companies to follow to get a better workforce. A lot of companies have an old school mentality and continue to fight against change. But, what I’m finding now because of teleworking and companies finding opportunities in remote regions it’s almost impossible to stay the same. Change is inevitable. This post is right on target with getting a better workforce through each individual employee which ultimately makes for a great company structure – well done and look forward to more post. So spot on, Spencer! Appreciate the support!